The FDA wants you to be aware of the growing problem of Antibiotic Resistance. The following information comes directly from the FDA literature on the subject. Antibiotic drugs can save lives. But some germs get so strong that they can resist the drugs. The drugs don’t work as well. Germs can even pass on resistance to other germs. Antibiotic drugs normally work by killing germs called bacteria, or they stop the bacteria from growing. However, sometimes not all of them are stopped or killed. The strongest ones are left to grow and spread. A person can get sick again. This time the germs are harder to kill. The more often a person uses an antibiotic, the more likely it is that the germs will resist it. This can make some diseases very hard to control. It can make you and your children sick longer and require more doctor visits. You may need to take drugs that are even stronger. Bacteria live in drinking water, food, and soil. They live in plants, animals, and people. Most of them do not hurt people. Some even help us to digest food. But other bacteria cause serious diseases such as tuberculosis (TB) and Lyme disease. If you have a virus, taking antibiotics is not a good idea. Antibiotics don’t work against viruses. The medicine will not help you. It might even harm you. Each time you take one, you add to the chances that bacteria in your body will be able to resist them. Later that could make you very sick. Finding the right treatment could be a problem. What Common Mistakes Do Patients Make? • Patients ask for antibiotics they don’t need. For example, they ask for antibiotics to treat a cold. • They don’t take antibiotics the way the doctor says. For example, they stop taking the drug before all the pills are used. That can leave the strongest germs to grow. What is the FDA Doing About the Problem? The FDA wants doctors to be more careful about giving antibiotics when they are not needed. • The FDA will require new labeling for doctors. • One of the new labels must say that these drugs should be used only for infections caused by bacteria. • Another label will ask doctors to explain to their patients the right way to use the drugs. 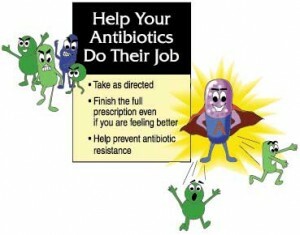 • Don’t demand an antibiotic when your doctor says you don’t need it. • Don’t take an antibiotic for a virus (cold, cough, or flu). • Take your medicine exactly the way the doctor says. Don’t skip doses. • Don’t stop taking your medicine when you feel better. Take all the doses. • Don’t take leftover medicine. • Don’t take someone else’s medicine. • Don’t rely on antibacterial products (soaps, detergents, and lotions). There is no proof that these products really help. The Federal Food and Drug Administration (FDA) states that antibiotics resistance is a growing public health concern worldwide. According to the FDA, when a person is infected with an antibiotic-resistant bacterium, not only is treatment of that patient more difficult, but the antibiotic-resistant bacterium may spread to other people. For many years we have relied on antibiotics to keep us healthy, sometimes to the point of insisting that we have an antibiotic even when our doctor tell us it is not warranted. The FDA describes antibiotics as drugs used for treating infections caused by bacteria. Misuse and overuse of these drugs, however, have contributed to a phenomenon known as antibiotic resistance. This resistance develops when potentially harmful bacteria change in a way that reduces or eliminates the effectiveness of antibiotics. Examples of the types of bacteria that have become resistant to antibiotics include the species that cause skin infections, meningitis, sexually transmitted diseases and respiratory tract infections such as pneumonia. In cooperation with other government agencies, the Food and Drug Administration (FDA) has launched several initiatives to address antibiotic resistance. The agency has issued drug labeling regulations, emphasizing the prudent use of antibiotics. The regulations encourage health care professionals to prescribe antibiotics only when clinically necessary, and to counsel patients about the proper use of such drugs and the importance of taking them as directed. FDA has also encouraged the development of new drugs, vaccines, and improved tests for infectious diseases. Antibiotics are meant to be used against bacterial infections. For example, they are used to treat strep throat, which is caused by streptococcal bacteria, and skin infections caused by staphylococcal bacteria. Although antibiotics kill bacteria, they are not effective against viruses. Therefore, they will not be effective against viral infections such as colds, most coughs, many types of sore throat, and influenza (flu). So how do you know if you have a bad cold or a bacterial infection? Joseph Toerner, M.D., MPH, a medical officer in FDA’s Center for Drug Evaluation and Research, says that the symptoms of a cold or flu generally lessen over the course of a week. But if you have a fever and other symptoms that persist and worsen with the passage of days, you may have a bacterial infection and should consult your health care provider. When you are prescribed an antibiotic to treat a bacterial infection, it’s important to take the medication exactly as directed. Here are more tips to promote proper use of antibiotics. Complete the full course of the drug. It’s important to take all of the medication, even if you are feeling better. If treatment stops too soon, the drug may not kill all the bacteria. You may become sick again, and the remaining bacteria may become resistant to the antibiotic that you’ve taken. Do not skip doses. Antibiotics are most effective when they are taken regularly. Do not save antibiotics. You might think that you can save an antibiotic for the next time you get sick, but an antibiotic is meant for your particular infection at the time. Never take leftover medicine. Taking the wrong medicine can delay getting the appropriate treatment and may allow your condition to worsen. Do not take antibiotics prescribed for someone else. These may not be appropriate for your illness, may delay correct treatment, and may allow your condition to worsen. Talk with your health care professional. Ask questions, especially if you are uncertain about when an antibiotic is appropriate or how to take it. It’s important that you let your health care professional know of any troublesome side effects. Consumers and health care professionals can also report adverse events to FDA’s MedWatch program at 800-FDA-1088 or online at MedWatch.